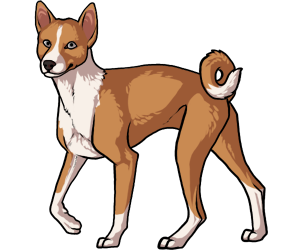 The Basenji is an ancient breed native to Central Africa. It was developed naturally and has remained relatively unchanged in appearance. The Basenji first appeared in ancient Egypt as a gift to the pharoahs. The breed became very valuable as a hunting dog in African tribes and civilization and are still used today in Africa as hunting dogs. The Besenji didn't reach England until 1937 and finally made it to America by 1938. Today, the Besenji excels in lure coursing and scent field trailing. The Basenji appears as far back as 4000 B.C., appearing in ancient bas-relief and sculpture. The Basenji doesn't bark, instead, it makes a sort of "baroo" sound along with a large array of other strange noises. Basenjis are cat-like, they commonly groom themselves and have a cat-like aloofness.